Do shoes have feelings ? Let’s say you are out for a night on the town. Your significant other turns to you and says how do you like my outfit? Unless you answer this question perfectly (still not sure how to answer this even after many years of marriage!) you may notice that your significant other withdraws for a while to cool off. Could be a few minutes, could be for the night, but this time away allows things to mellow and return to a state of bliss yet again. What does this have to do with shoes? It’s common practice for a lot of runners to have multiple pairs of shoes at one time. This though process behind this has been that running in a shoe breaks down the cushioning properties of the shoe, and it takes time for it to rebound before your next run. Well, Let’s look at some objective information on this subject. This is not going to turn into a discussion of minimal shoes vs. traditional construction. We are simply going to look at what happens to the properties of the midsole itself. The midsole is the squishy part of the shoe that lies between your foot and the tread. Its commonly made of a chemical compound called ethyl-vinyl acetate (EVA). Shoe manufacturers manipulate properties of the midsole to get their shoe to perform a certain way. Obviously a minimal shoe has less of this midsole material in it then a traditionally constructed shoe, but they both have some type of cushioning material between the foot and the shoe tread. As you run, you are applying mechanical forces to the shoe itself. These forces physically break down the midsole. In fact, lets look at this at the microscopic level. The following picture is from a study (1) that looked at the state of the midsole at various points in the shoe’s lifespan. In fig A, you are looking at an electron micrograph cross section of a brand new shoe. It’s easy to see the outline of the well defined air pockets in the midsole. This intact formation allows the midsole to perform as it was designed. Fig B shows a cross section of the midsole after 500 kilometers (310 mi). This type of magnification allows you to see that the edges of the former well defined air pockets are now frayed and weakened. Finally, Fig C shows the midsole after 750 Kilometers (466 mi). It is now possible to see that the majority of the air pores are frayed, and in fact some of them have actually deformed enough to create holes. Thus, the structural properties of this midsole material are now very different from what they originally were when new. While your body can repair tissues that have been affected from mechanical stresses in running, your shoes cannot. Resting your shoes by the front door between runs won’t reverse these changes. While it’s probably a good thing to be nice to your shoes (running in wet environments with no chance to dry out may accelerate breakdown of the midsole), they don’t have feelings. You can pound on them day in and day out – even 2 runs in the same day. The breakdown of the material in your shoe is cumulative. So what happens to our gait as shoes breakdown? A 2009 article (2) revealed that running in worn shoes caused the runner to increase their stance time (time spent on the leg) and alter their lower leg range of motion in order to keep forces on the body somewhat constant. What does this mean? As your shoes break down, the body will slightly alter its gait style adapt to the gradual changes that occur in the shoe itself. When do these gait alterations reach critical mass (causing injury if you don’t buy new shoes)? Shoe breakdown is variable depending on the runner’s mass, running surfaces, and gait style. I know runners who note that they become injured if they put more than 250 miles on their shoes, and I know runners that put well over 1200 miles on a single pair. The old school rule of thumb states 400-500 miles, and is likely a good starting point based on the research stated above. Verdejo, R. , Mills NJ. 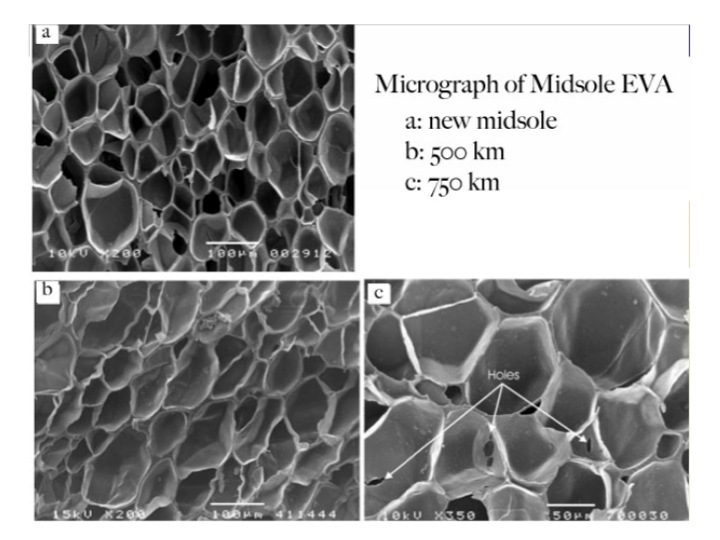 Heel-shoe interactions and the durability of EVA foam running-shoe midsoles. J Biomech. 2004. Sept; 37(9):1379-86. This entry was posted in rehab, running, Uncategorized and tagged foot, form, gait, gait analysis, plantar, rehab, running, shin splints, shoes, speed clinic, stress fracture, technique on May 16, 2011 by an athlete's body. Good stuff, Jay! Electron microscopic changes very cool. Permanent compression of the midsole also affects the heel height differential. Compression occurs primarily where there is greater force applied, which we all now know is in the forefoot. (Even the most severe heel striker bears most of his/her body weight onto the forefoot). Meaning that even a flat foam midsole ends up having a relatively higher heel. Excellent point! – the foot likes to be on surfaces that provide uniform support. Looking at worn midsoles shows they don’t just chance form heel to forefoot, they also tend to “hammock” out fmr indside to outside…..as in non-uniform support across the forefoot….this doesn’t help out with stability during push off. This and previous posts are nicely written and sensible, but I wish there was information on the blog about authorship. There’s no byline, and the about page for the site is a template. Commenters seem to know it’s “Jay.” 😉 Who’s writing, UVCE? Jay Dicharry here – I am director of the SPEED Clinic here at UVA. More about me if you check out the “about us” tab on the website. The blog is the result of all my ramblings. Thanks for reading! Thanks for the introduction, Jay. Your posts here inspired some writing on my site about the Zadpoor & Nikooyan paper, where I quoted you a couple times. I’ve also been in touch with Casey Kerrigan since commenting here, and ended up doing an article for her OeshShoes.com blog. Always great. I wonder if you could shed any insight into the Giuliani findings. After reading further into the abstract and full findings, a few red flags pop up. Was this a study or an observation? After looking into it I didn’t come across anything that was measured or controlled. Further it looks like they only talk about two people. What is really the point of having an abstract of an observation published by U.S. National Library of Medicine National Institutes of Health when passively observing two people? A little further research indicates that these observations were done at the West Point Army hospital. And despite the number of people who may have attended the hospital or their practices in the previous months, only these two runners were isolated for their injuries. Are we lead to believe that these are the only two who have hobbled around campus recently? The amazing part here is they were both cited for their running experience and the only thing that changed was a “barefoot-simulating footwear” and that is it. In the PubMed abstract they did not indicate a specific shoe. However in the complete review it was said both runners were wearing Vibram Five Fingers. The timing is interesting because the Army banned the use of VFF because they “detract from a professional military image” about the same time. The Guiliani findings nor the Army ban cite each other. The findings do discuss the role of running form and the possible impact of a cushioned running shoe on mechanics, but that appears at the end of the paper. There seems to be a passive indication from the author that not making an adjustment to running style may have been the contributing factor to the stress fractures, not necessarily the shoe. Thanks Jay! Keep up the good work. > It’s common practice for a lot of runners to have multiple pairs of shoes at one time. You forgot the other reason, that different shoes for each run means that your foot is not locked into a single style. My rationale for this is that if one shoe has minor imperfections due to either wear of manufacturing defects, a different shoe from a different manufacturer is unlikely to have the same issues. So alternating the shoes provides a measure of protection against overuse issues due to faults in the shoes. I probably put over 5,000 miles on my last pair of New Balance, and the current pair probably has close to 1500 miles. I have not gotten injuries, despite my age (now 58; mid-40s when I purchased the first pair) and perhaps partly partly because of my weight 135-140. I began running in 1990; did exclusively bicycling (a lot) before that. If you take a pair of shoes and put them on the starting line, they go nowhere. The person wearng the shoes does the work. If you are a biomechanically efficient runner, the shoe is doing very little. A lot of runners I’ve worked with put over 1000 miles on shoes, but as I said, they are effecient enough that the shoe really doesn’t matter at all. Its all about the runner right? When i first heard about shoes wearing out, iI understood it to be because they get compressed and the form becomes less cushioned. At the time that didnt really bother me too much so i have tended to put a fair number of miles on my shoes for economic reasons. However I just retired a pair of shoes last week because when compared to a new shoe of the same modell the forefoot area had become significantly softer. I guess the tears in the eva structure lead to a softening as the bubbles of air have more and more room to deform as the structure breaks down and tearms and holes become more common. I still have a good number of shoes in my rotation, but do so more for the varience that running in multiple differnt models and styles of shoes provides. Although being able to avoid putting on a still wet pair of shoes is also nice.